A trotter born near Peterborough earned the distinction of being the last Standardbred winner at Woodbine racetrack when they hosted their final card of harness racing last night. 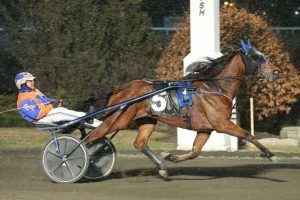 Parkhilll Nonstop, a four-year-old trotter bred by John Bax’s Parkhill Stud Farm of Peterborough and Robert Van Camp of Port Perry, was a five length winner in 1:57, a new life mark. Trainer Pat Hudon was up behind the son of Majestic Son he co-owns with a numbered company from Alberta. The victory was the second in 13 tries this year for Nonstop who went over the $100,000 plateau in life earnings with the win. He is the first foal of Oaklea Uppity, who Bax raced at Kawartha several times during her brief racing career. She is a sister to Bax’s former champion Oaklea Omega, a winner of $449,000 during her career. Live Standardbred racing now moves to its new permanent home, Woodbine Mohawk Park, in Campbellville. The 2018 meet begins Thursday evening. Post time is 7:30 p.m.
Parkhill Nonstop wins the final harness race at Woodbine.